Below are photo examples of the customization options you can apply to your album. See what you like and fill out the form below based on the visual customization options! Feel free to email me with any questions! 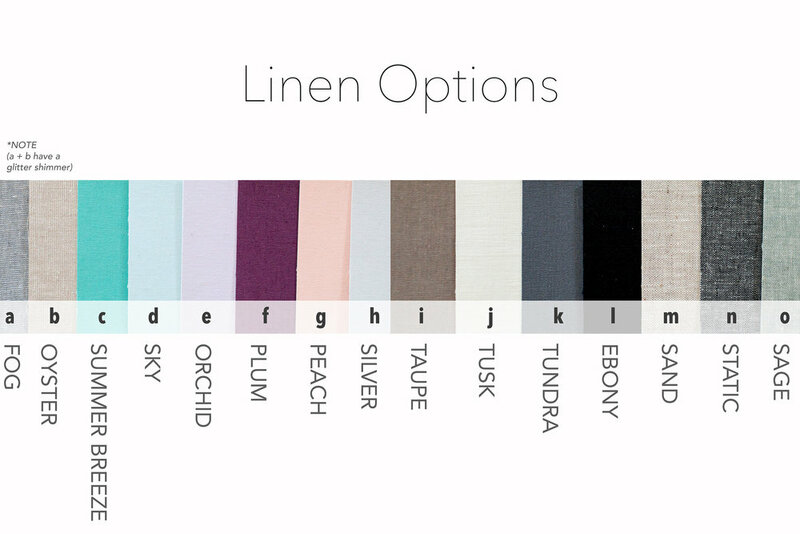 You have the option to choose a leather cover OR a linen cover. See example swatches below. Gilding is the process of applying gold leaf to the edging of the book. NOTE: If you want gilding you have to use square corners, you cannot use rounded corners and have gilding. You have the option to have foil stamping text on the back inside cover. It allows for up to three lines of text in the same size font. An example that our couples have done in the past is their names and wedding date but you could do anything you want. Up to you! **Please note that there is a 28 character limit per line. Gilding is the process of applying gold leaf to the edging of the book. If you don't want gilding you can select no gilding. If you are not using the gilding option, you have the option for square or rounded corners. Would you like the inside back cover foil stamped text? Which font would you like your text in? The text will be on white unless you chose gold or black gilding. Please write out what text you would like foil stamped line by line exactly how you would like to see it. If you want all caps please write in all caps. Please note that there is a 28 character limit per line. Thank you! I will apply these customizations to your order. NOTE: Make sure you let me know what cover image you want (if you haven't already) on the front of your album! Feel free to email me if you didn't put the note in the album. See example below.